The President of India, Shri Ram Nath Kovind, addressed the closing session of the 15th Pravasi Bharatiya Divas Convention and presented the Pravasi Bharatiya Samman Awards in Varanasi, Uttar Pradesh, today (January 23, 2019). 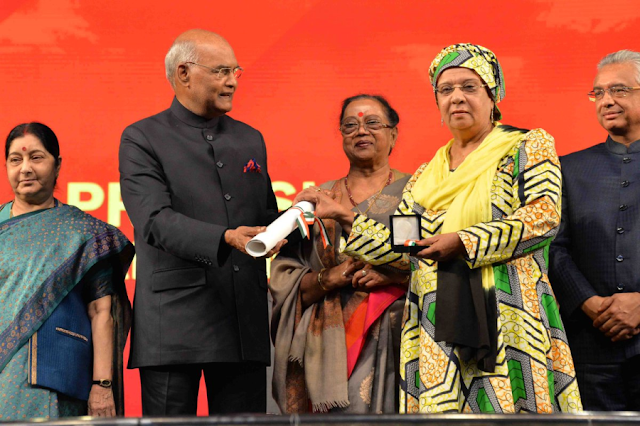 Speaking on the occasion, the President said that the Indian diaspora is among the largest in the world and its history is as rich and diverse as the diaspora itself. In the past, our ancestors travelled to Southeast Asia as merchants and as monks. Much later, many lived and prospered as traders and entrepreneurs along the Silk Route. And more than a century ago, under the indenture system, we witnessed millions of our people crossing the seven seas. The world has moved a long way since for our diaspora. They are commanding global heights today, while embracing their cultural ethos and diversity. And while they do so, they must also preserve and strengthen their unity as a community. The President said that India today is a land of a billion ideas. India today is a land of a billion opportunities. He invited the Indian diaspora to become a part of India’s growth story. He said that we count on the diaspora’s convening strength to encourage people to visit India, as knowledge-providers and as tourists. We want to change the brain-drain of yesterday to the brain-gain of today.He called upon the diaspora to contribute to and partner in the New India. Earlier in the day, the Prime Minister of the Republic of Mauritius, Shri Pravind Jugnauth, who is attending the Pravasi Bharatiya Divas Convention in Varanasi, called on the President. During the discussions, the President thanked Shri Jugnauth for being Chief Guest at the Pravasi Bharatiya Divas Convention and said that his presence attests to India-Mauritius special and unique ties and shared history and heritage. 1. I am delighted to be amongst you at the Closing Session of the 15th Pravasi Bharatiya Divas Convention.I have met some of you in different parts of the world, but to be with you on this occasion is,indeed,special. The august presence of our Chief Guest, Prime Minister Jugnauth, makes it even more so, and attests to the unique ties that we share with Mauritius. I am happy to have conferred the Pravasi Bharatiya Samman on 30 members of our Diaspora. We value your committed efforts to promote India and to work for the welfare of Indian community abroad. You have, indeed, been a living bridge between us and the outside world. I congratulate each one of you for this stellar contribution. 2. As you know, India has been a land of festivities, celebrations and human excellence for centuries. Its cultural fabric and ethos have been enriched with each passing phase of its history. And to that, we added a new chapter when we embarked on a journey to connect and embrace our brothers and sisters around the world. That was in 2003, when we held the first Pravasi Bharatiya Divas,and the man behind this vision was our then Prime Minister Shri Atal Bihari Vajpayeeji. We lost him recently but his thought and wisdom continue to guide the nation. 3. The 15th Pravasi Bharatiya Divas celebration is special, and for several reasons. This year, we are marking the 150th birth anniversary of Mahatma Gandhi, whom we consider our greatest pravasi and in whose honour we have chosen 9th January as the Indian Diaspora Day to be celebrated each year.It is also the first time that we are hosting this festivity in Varanasi, a city which is so much part of our lives-our thought, our beliefs,our music and dance,and our spirituality. And as we talk of Varanasi, there is yet another facet that we must recollect.The ghats of this ancient city and its surroundings have been witness to one of the most poignantepochs of our diasporic history. For Prime Minister Jugnauth and many others, whose forefathers hailed from a place not far from here, this visit would, indeed, be a very special one. In a sense, in this Convention Hall, the journey undertaken centuries ago, has come a full circle today. There would still be others who would find it fulfilling to connect to their roots through the eclectic those of this timeless city. 4. From here,many of you would be travelling to the Kumbh to be blessed by the Sangam. And days later, you would witness the onward march of our Republic as a modern nation. I am sure we could not have asked for a more joyous festival! I hope you enjoy every moment of it. 5. We are living in an age of rapid changes. The youth is in the forefront of these developments. I am happy that we had a special focus on the youth in this festival.We must listen to them and to their ideas, to make our bonds deeper and stronger. I am pleased that two of the youngest diaspora leaders, Mr. Himanshu Gulati, Member of Parliament from Norway and Mr. Kanwaljit Singh Bakshi, Member of Parliament from New Zealand participated in this Convention as Special Guests at the Youth Pravasi Divas. 6. The Indian Diaspora is among the largest in the world and its history as rich and diverse as the Diaspora itself. In the hoary past, our ancestors travelled to Southeast Asia as merchants and as monks. Much later, many lived and prospered as traders and entrepreneurs along the ancient Silk Route. And more than a century ago,under the indenture system, we witnessed millions of our people crossing the seven seas. The world has moved a long way since for our Diaspora. You are commanding global heights today, while embracing your cultural ethos and diversity. And while you do so, you must also preserve and strengthen your unity as a community. 7. Your success and hard work have set an example which many want to emulate. The communities that you live in, count on your enterprise and skills; the countries that you reside in, are proud of your citizenship;and the world-at-large turns to your ingenuity when faced with intractable challenges. We count each one of you as our cultural ambassador. You are the face of India and its identity abroad. We are, indeed, proud of you and your achievements. But what really makes your contributions standout are the values that you espouse and live for. These are values that intrinsically remain Indian, drawn from millennia of thought and progress, and which are firmly anchored in our age-old belief of “Vasudhaiva Kutum bamkam” that is – “the World is One Family”. 8. The last few years have seen a sea-change in the way we engage our people abroad. Under the leadership of Prime Minister Shri Narendra Modi, India has worked hard to connect its 1.3 billion people with its 31 million strong Diaspora. New programmes have been established to bring Indians and Indian-origin people living abroad closer to our hearts and minds. Projects such as the “Know India Programme” and the “Bharat KoJaniye quiz” have instilled our youth with a new sense of confidence in their motherland. They want to strengthen their connect with India, for emotional and cultural reasons, but increasingly for other persuasive reasons too. The breakthroughs happening in India in the fields of innovation, research, start-ups and digital revolution are attracting people from far and wide. To give this pull a concrete shape, we have started “Experience the Scientific India Programme” for our young Diaspora scientists. We want them to become a bridge between us and the world so that we can cross- pollinate and enrich each other. 9. And while giving a new meaning to our umbilical connect, we have also taken measures to improve the “Ease of Travel” and the “Ease of Living abroad” for our people. Today, under the able guidance of our External Affairs Minister Smt. Sushma Swaraj, our Embassies and Consulates are available 24 by 7 to help those in need. We have brought the benefits of the digital world to their doorstep through E-Visa, Passport App, MADAD and e- migrate platforms. Likewise, we have employed social media tools, from Twitter to Facebook, to reach out and help.Our visa, passport and OCI services have been made flexible, for the benefit of many.For our professionals, we have entered into Social Security Agreements with a large number of countries, so that their financial contributions are protected. And for our migrant workers, we have starteds killing programmes and pre- departure training to enhance their income and to ensure their wellbeing. 1 At the same time, we remain deeply committed to the safety and security of the Indian community abroad. In the last 4 years, our government has rescued over 90,000 Indians caught in political strife or natural disasters. We have also facilitated the return of over 94,000 Indians during Amnesty schemes in the Gulf countries. As a result of these actions and assurances, our Diaspora has a new confidence in the country and in the government. 11. India is going through a transformation of unprecedented scale. The Indian story today is one of inclusivity and progress. From economic growth to economic reforms, from women emancipation to women empowerment, from Health for All to Total Sanitation, and from Space Mission to Digital Revolution, we are leading the way on many fronts.Our socio-economic achievements are helping the Sustainable Development Goals, and our growth,powering the global economic engine. We have put ourselves in the forefront of the 4th Industrial Revolution, and through the International Solar Alliance, we are leading the world in combating Climate Change. 12. India, today, is a land of billion ideas. India, today, is a land of billion opportunities. I invite each one of you to become a part of India’s growth story which is being etched by its billion minds. We want to leverage your technology, know how and investment to power our Make in India, Digital India, Clean India and Skill India programmes. We count on your convening strength to encourage people to visit India, as knowledge- providers and as tourists. And we want more and more of you to connect with your ancestral villages and towns. We want to change the brain-drain of yesterday to brain-gain of today.I once again call upon you to contribute and partner us in the New India that we are committed to build and to become a part of India’s history in making. 13. With these words, I thank you for making the Pravasi Bharatiya Divas a success. I wish all of you a prosperous and enriching year ahead. And I eagerly look forward to your participation in the Republic day Parade.